A rare and stunning cultivar of deciduous Magnolia, ‘Vulcan’ has showy, large purple/pink flowers which are lightly scented. Held upright on the branches, the flowers are shown to maximum effect and you can enjoy watching them gently fade in colour with age. As a bonus, in poor years or a poor situation the flowers maintain their colouring well. It also benefits from flowering from a young age, although the full depth of colour of the flowers increases with maturity. Magnolia virginia 'Vulcan' grows to a rounded shaped tree with an open framework of branches. It is good in any well-drained, fertile soil, in sun or partial shade, preferably not catching the early morning sun which can lead to frost damage on the buds. This variety is one of the famous Jury Magnolias, bred by Felix Jury in New Zealand. 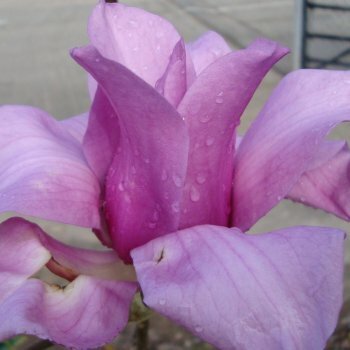 This is a great choice of Magnolia for a slightly unusual purple/pink flower colour and a striking presence. Our pot grown Purple Magnolia 'Vulcan' can be planted at any time of the year. Firstly, remove all weeds and grass within a metre of your desired planting hole. Dig a square hole as deep as your root mass and approximately 2x as wide. To help your Magnolia establish more effectively, sprinkle root grow in the hole. For tree forms of Magnolia Vulcan, we recommend using a stake and tie kit and rabbit guard when planting, but these are not needed for the bush forms. The help and advice section has further information and videos. Purple Magnolia 'Vulcan' bushes can be pruned into shape, but should not be heavily pruned as they can go into shock. Simply remove any damaged branches or any that are growing in an awkward position. If pruning to limit the overall size, stagger your pruning over a few years to alleviate the stress on your tree. Pruning for Purple Magnolia should be carried out in mid-summer to early autumn. Avoid pruning in late winter to early spring.